Please Fill out our online quotation request form. 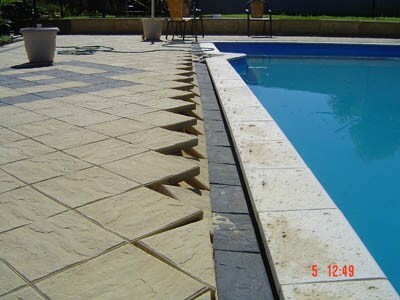 Some contractors working in Perth around fibreglass and concrete pools are unqualified to do works such as pencil compacting. 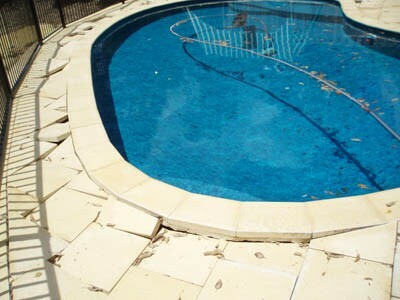 Please be aware using unprofessional contractors may void the warranty on your pools shell and are not recommended by the major pool companys for obvious reasons. Before organising any works around your pool we recommend contacting your pool company and make sure they recommend only professionals who will fully guarantee their work and are willing to provide independent customer references. The pictures above illustrates what can happen if an unqualified contractor compacts a pool. The shallow end of the pool has sunk by 30mm creating an uneven look when the pool is full. It now requires supports under the edgebeam to jack the shell to the correct height. For immediate paving & to avoid sinking pavers. Against heavy machinery on driveways paving, grass & concrete. We provide LONG and SHORT TERM HIRE of temporary fencing around Pools, Building Construction sites and Concert Event sites. We will supply you with top quality Temporary Fencing products that you hire with confidence. For all your Paving needs. Please phone 0439 954 467 to arrange a quote.